The IUF and Spanish-based Meliá Hotels International have signed an agreement on preventing sexual harassment in the workplace, the first such agreement between the IUF and an international hotel chain. 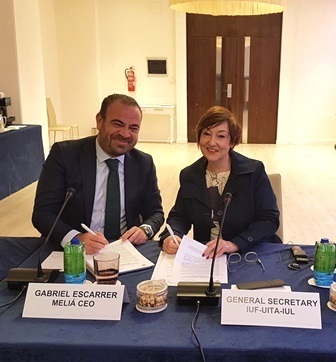 The agreement was signed on January 17 by IUF General Secretary Sue Longley and Meliá CEO Gabriel Escarrer in Palma de Mallorca, Spain as part of the process initiated with the 2013 IUF/Meliá agreement on workplace rights . The agreement incorporates the ILO definition of what constitutes sexual harassment, affirms a policy of 'zero tolerance' and commits both parties to develop appropriate local implementation procedures based on a shared recognition of the need "to protect the dignity of everyone who works for Meliá, as well as their rights relating to their physical and moral integrity and non-discrimination." Progress in implementation will be jointly evaluated on a regular basis. CEO Gabriel Escarrer emphasized the importance and the timeliness of the agreement within the framework of the agreement with the IUF on fundamental workplace rights and Meliá's commitment to ensuring respect for human rights throughout the business. IUF General Secretary Sue Longley welcomed Meliá's lead in addressing the widespread presence of sexual harassment in hotels through a formal commitment to joint prevention with the IUF. "Our members have reported that as many as 85% of employees in the hospitality industry have experienced sexual harassment on the job" said Longley. "Melia has shown the way forward in an industry increasingly dominated by global brands. We look forward to developing the implementation process through negotiation at global and local level." Meliá is the largest hotel chain in Spain with worldwide operations in 41 countries under the Gran Meliá, ME by Meliá, Paradisus, Meliá Hotels and Resorts, Innside by Meliá, TRYP by Wyndham and Sol Hotels brands. Click here to read the agreement in English , and click here to view the original version in Spanish .